A modern and accessible venue based in central Manchester offering spacious and vibrant facilities. Redbank House has 2 flexible rooms that can accommodate a range of events such as: training courses, conferences, seminars, mini exhibitions and much more. As well as these facilities Redbank House has various competitively priced office space available, primarily for voluntary organisations and those who are within or support the development of the health and social care sector. Visit the Redbank house website. The professional and dedicated team will ensure your event will run smoothly by providing excellent customer service and a flexible approach to meet your needs. 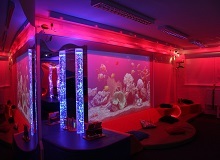 Redbank House also has two fabulous and unique multi-sensory rooms. A personalised and secure sensory environment available to individuals and groups for private sessions. A multi-sensory environment has shown to be beneficial for adults and children with disabilities. 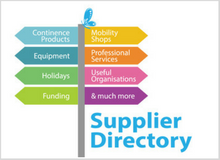 Visit the multi-sensory page for booking information. All the rooms are bright and spacious. 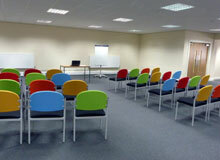 Redbank House offer break out and kitchen areas that are perfect for meetings, training and exhibitions. A multi-sensory space offering a private environment where senses can be developed and explored for people with special needs. If you’re looking to move or expand your business Redbank House has a wide variety of spaces in which we can accommodate your needs. Redbank House is one of my favourite venues and it has fantastic facilities. There’s lots of space, it’s clean, efficient, and the staff are very friendly. 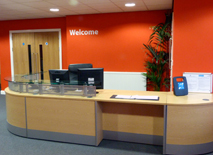 The friendly team are there to help you get the most out of Redbank House’s services. Redbank House is open Monday – Friday 8.30am to 5.00pm. Alternatively you can contact Redbank House at any time via email: info@redbankhouse.com. We look forward to hearing from you.